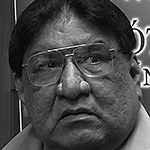 Lakota Language Consortium Why Save Lakota? Native American languages with a significant chance of being revitalized. If the effort is made. We wouldn’t be anywhere without the native speakers. But now they need someone to take the reins and move forward. 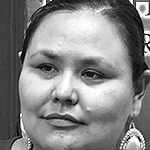 Courtney Yellow Fat, Traditional singer and Lakota language teacher. I feel that in order to actually heal the people from all the trauma and devastation and poverty, it’s going to be the return of our language. That’s what’s going to bring us full circle and that’s what’s going to heal us as a people. 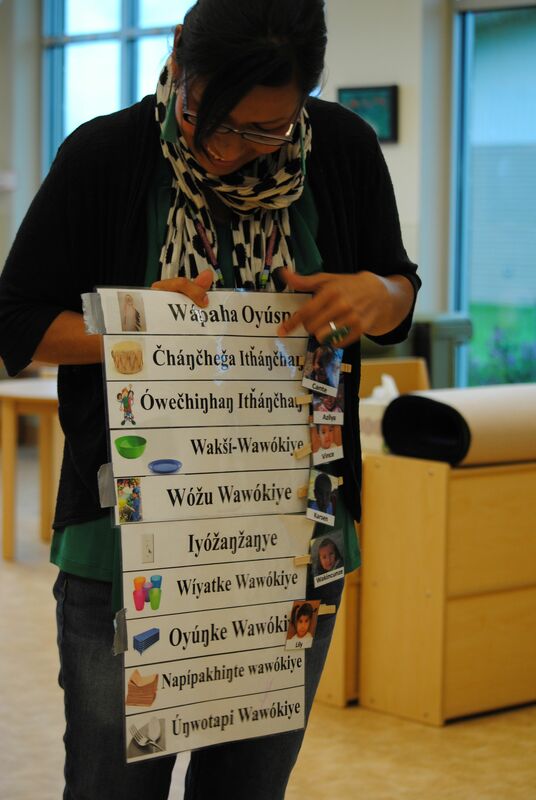 Waniya Locke, Native fluent speaker and language activist. When we lose our language, we lose our culture. We’re finding out that ever since we were settled on the reservation about 125 years ago, the language we were speaking started changing. The change was so subtle the speakers of the language didn’t realize it was changing. English thinking influenced Lakota speaking and we didn’t realize these things until we started to study the grammar of our own language. 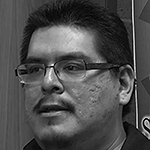 Ben Black Bear, LLC Board Vice President, founder of the Lakota studies progam at Sinte Gleska University, first-language Lakota speaker and teacher. "The loss of languages is tragic precisely because they are not interchangeable, precisely because they represent the distillation of the thoughts and communication of a people." "You will never recapture what the Persian Said in his language woven with birds and roses, When, in the sunset, before the light disperses, You wish to give words to unforgettable things." All languages have their own traits, and so in turn does their loss. According to several scholars, the loss of Lakota would mean the loss of a certain way of looking at the world. Lakota is unique from languages like English because of the intimate way it is tied to the pre-reservation world. This world was closely associated with living in small groups, living close to nature, traveling a good deal across large areas, and having a rich spiritual life. 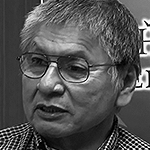 Lakota cultural attributes are reflected in the language. For example, Lakota is rich in ways to describe the many subtle aspects of social behavior revolving around areas of feigning interest, pouting, courting, and many others. Moreover, in Lakota, nature is used as the primary source for the metaphor models. Physical appearance is often tied to nature, for example, someone could be "Skinny as a crane," or "Ragged as a turtle." Lakota is also very good at emphasizing the finer attributes of travel. A person can be considered to be coming or going to or from specific places in many levels detail. Lakota greetings themselves reflect this tendency, wherein English "welcome" is literally Lakota - "Good that you came," And "goodbye," is "Travel well." The language also closely linked the land to the people through geographical names and stories. Lakota philosophical and spiritual concepts often tie together these realms. A word like woímnayankel, expresses notions of awe, humility, and interconnectedness. A Lakota speaker might use this when describing the experience of the northern lights (aurora borealis). The word expresses the humility that a person feels when confronted by the awesomeness of nature while also feeling intimately connected with it. Lakȟótiyapi na wašíčuyapi kiŋ líla íčhitȟokeča, ičhíŋ Lakȟótiyapi kiŋ eháŋni wičhóuŋ él aíkȟoyagye. Wičhóuŋ kiŋ héhaŋ oyáte kiŋ thiyóšpaye-tȟuŋtȟuŋyaŋ úŋpi, makȟá ikčéya úŋpi, théhaŋyaŋ iglákapi na áwičakȟeya táku wakȟáŋ ohólapi na wačhékiyapi. Lakȟótiyapi kiŋ Lakȟól wičhóȟ'aŋ aíkȟoyake. Lakȟótiyapi kiŋ uŋ oyáte kiŋ tókhel oȟ'áŋpi kiŋ hé tónakiyakel eyápi na kȟápi. Tuwéke č'éyaš táku tókȟuŋ-kapiŋ naíŋš wačhíŋkȟo naíŋš wíyokhiya na ísaŋm óta. Naháŋ nakúŋ Lakȟótiyapi kiŋ makȟá oúŋčhağe na makȟóčhe kiŋ wóilagya wíyačhiŋ. Héčhel owáŋyaŋke eyá makȟá oúŋčhağe uŋ iyáčhiŋpi. Héčhuŋpi s'e tuwá "Pheháŋ s'e tȟamáheča" naíŋš "Khéya s'e upíȟči" eyápi. Nakúŋ Lakȟótiyapi kiŋ él ománi-wičhóiye líla óta. Tuwá léčhiya ú naíŋš hí na héčhiya yá naíŋš í, naháŋ nakúŋ letáŋhaŋ hečhíyotȟaŋ iyáya naíŋš hetáŋhaŋ lečhíyotȟaŋ hiyú; naháŋ kú naíš glí, na glá naíŋš khí, na letáŋhaŋ hečhíyotȟaŋ khiglá naíŋš hetáŋhaŋ lečhíyotȟaŋ gličú. Na wóškaŋ wičhóiye kiŋ hená líla-ȟči ísaŋm óta. Nakúŋ “Taŋyáŋ yahí” eyápi na “Taŋyáŋ ománi yo/ye” naíŋš “Tókša akhé” eyápi. Nakúŋ oyáŋke čhažéyatapi na wičhóoyake kiŋ uŋ iyápi kiŋ makȟóčhe na oyáte kiŋ íčhičaške. Lakȟóta wóksape wóuŋspe na Táku Wakȟáŋ ohólapi kiŋ él hená oyás'iŋ aíkȟoyake. Héčhel wóimnayaŋkel eyápi kiŋháŋ táku óta kȟápi. Tuwá glahéya Lakȟótiyiŋ na haŋwákȟaŋ tȟaŋíŋ waŋyáŋke čháŋnašna heyé. Táku waŋ wówapȟetȟokeča iyéčhel čha héčheča waŋyáŋkapi čháŋnašna iglúhukhuyakel úŋpi na hé wičhóiye kȟápi kiŋ hé é, naháŋ nakúŋ kičhí ówaŋžila úŋpi. 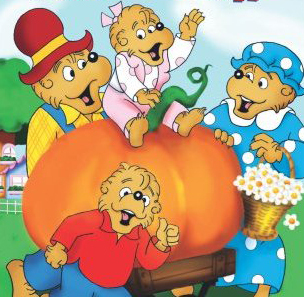 LLC has worked to develop multiple different media projects in Lakota, including production of audio CD's, collaboration on the upcoming documentary Rising Voices with our sister organization The Language Conservancy and the Lakota Berenstein Bears, the first cartoon series in the Lakota language to name a few. You can watch clips of the video projects on our YouTube channel and check out our audio CD's at the LLC Book Store. 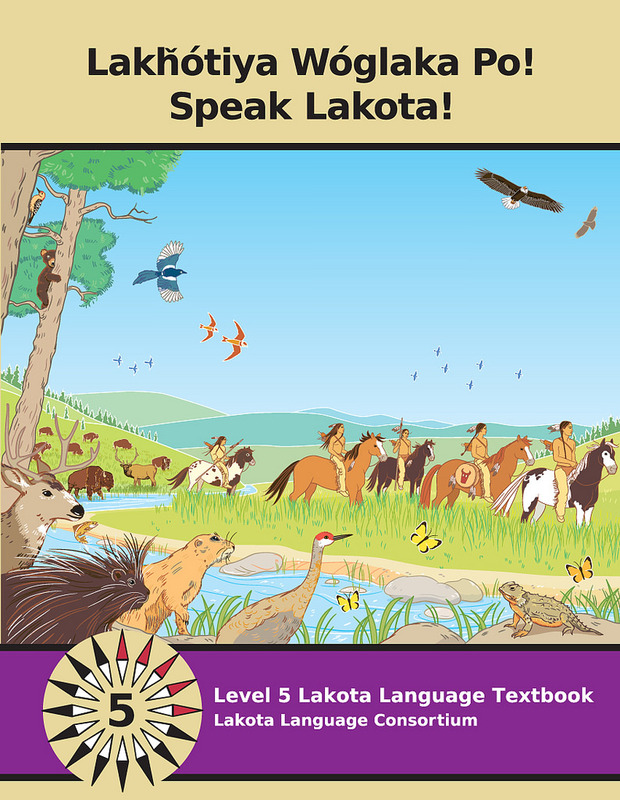 Since 2004, the LLC Bookstore has been serving customer needs by providing materials that improve Lakota instruction in schools and assist individuals in their study of the language. As a nonprofit, LLC's primary goal is to develop and distribute products that support effective language revitalization. Proceeds from the LLC Bookstore go directly back into the development of language materials. 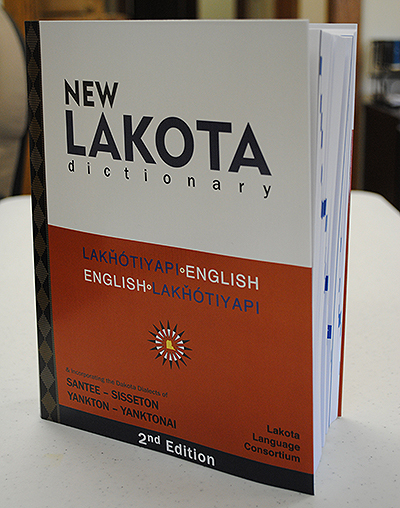 The 23,000-word New Lakota Dictionary, now in its second edition, provides a reliable, accurate, and user-friendly reference text and serves as a central component of the revitalization movement. You can purchase your own copy at the LLC Book Store. In addition to our print dictionary, LLC has also created the New Lakota Dictionary Online and is currently in post-production on the audio element of that Dictionary.